MIANZHU, Sichuan Province: Yu Changfu felt desperate when his house collapsed in the magnitude-8.0 earthquake in Sichuan province on May 12, 2008, for he had no money left to earn a living after rebuilding the house. Thanks to the Grameen-CPAD-Danone Micro-Credit Initiative, however, the 41-year-old farmer in Mianzhu, one of the hardest hit cities in the devastating quake in Sichuan, borrowed a loan of 10,000 yuan earlier this year to raise pigs and rabbits and buy a machine to mill rice. Last week, he sold several pigs earning more than 2,000 yuan. “I have confidence in repaying the loan and starting a new life,” he said with a smile. 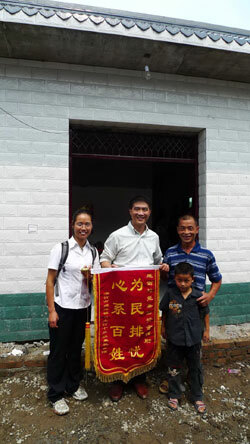 To express his gratitude to the initiative, Yu, who is short but very energetic, had a silk banner made and presented it to Eric LAM, program leader of Danoe China Social Program, during his recent visit to Yu’s new home in Mianzhu. Based in France, Danoe, one of the biggest food and beverage producers in the world, has been devoted to poverty relief in rural areas of China. Grameen Trust, a sister agency of the famous Grameen Bank set up by Professor Mumhammad Yunus, has been dedicated to poverty alleviation through the microcredit program. After the destructive earthquake last year, Danoe and Grameen Trust told China’s State Council Leading Group Office of Poverty Alleviation and Development (CPAD) that they would like to assist the quake zone in its reconstruction. On July 30, 2008, Danoe, Grameen Trust and CPAD signed a cooperative memorandum to set up the Grameen-CPAD-Danone Micro-Credit Initiative with a donation of 20 million yuan from Danoe. Grameen Trust provides technical backing for the initiative, CPAD offers policy guidance and China Foundation for Poverty Alleviation (CFPA) is in charge of its implementation. “The initiative is aimed at providing sustainable credit support for poor farmers and people affected by the earthquake so that they can earn a living and improve their living standards,” said Liu Dongwen, CFPA deputy executive director. Six cities and counties have been chosen to implement the initiative on a trial basis. They are Mianzhu and Shifang cities in the quake zone, Kulun County in Inner Mongolia Autonomous Region and Wuyi, Wanquan and Pingquan counties in Hebei Province. “Three years after the initiative’s launching, it is expected to provide loans totaling 168 million yuan for 24,000 farmers each year. In the long run, the initiative will be spread to more poor regions,” Liu said.